Every job has its own health and safety risks. The most common ones are chemical, biological, physical or electrical hazards. It's up to us to do our part to avoid any accidents. Working in a lab you are most likely facing many risks. No matter how safe a lab is setup to be, the different hazards will always be there. It's important to be cautious and wear the appropriate gear to minimize accidents. 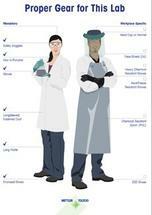 The Personal Protective Equipment (PPE) poster can help you ensure all workers in your lab are using the right equipment. You can adapt it according to your specific application needs by ticking the boxes of the specific gear that is applicable to your lab. You can also add additional equipment if it's not on the poster yet. Download and print the PPE poster to contribute to your lab safety!